Eating out in Venice is a notoriously unsatisfying experience. For a start, the town is renowned for its poor cuisine in general, when compared with other parts of Italy. And with an ever-dwindling local population but thousands of tourists, most restaurants are not particularly interested in repeat custom. Basically, if their customers feel ripped-off and badly-fed, the owners don't care: there'll be another crop of tourists in tomorrow night. Fortunately this attitude, while common, is not universal. There are still some authentic 'local' places to eat, and it is possible to eat a good meal while paying prices that are only slightly higher than elsewhere in Italy. The choice isn't huge, so it's worth doing some research and booking ahead. 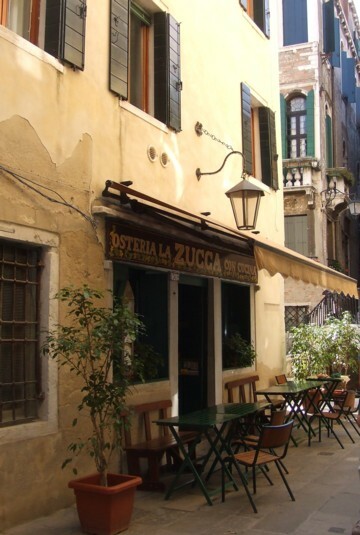 Venetians aren't as obsessed with food as other Italians; they often grab snacks while standing at bars. A local feature is the bacaro, where small dishes - rather like tapas - are sold at the bar and consumed standing or perched on a stool. This is a quick way to eat, but rather daunting for foreigners without any Italian, and also not very relaxing after arduous sight-seeing. As a quick rule of thumb: avoid anywhere with a 'tourist menu' or pictures of the food. Waiters in bow ties, and those who tout for custom outside are also best avoided. Wine prices are another indicator of a tourist trap. In a normal restaurant you'd expect to find house wine (vino della casa) - white and red - listed by the quarter and half-litre as well as by the litre (sometimes in the drinks list rather than the wine menu). A half-litre should only cost around €5, and a quarter litre around €3. If they only serve bottles of wine at over €15 this is very definitely a 'tourist' restaurant where the management are chiefly interested only in your money. Try to spot restaurants where locals, or at least other Italians, are dining. In Venice you can expect to pay as much as €2 per person as a cover charge (coperto), which should be listed on the menu. A few restaurants also add on up to 12% service charge although this is unusual and again, must be stated in the price list. Italians tend to tip a few euros rather than the 10% or more which is common elsewhere; there's no strict rule and in family-run restaurants where you're served by the proprietors it's common not to tip at all. Two people can eat a simple, filling meal for around €30 altogether (including cover charges), by sticking to a pizza and house wine. A good meal with 2-3 courses plus house wine will cost around €55 for two. Eat only the courses you want. A traditional Italian meal begins with a starter (antipasto), continues with a pasta dish (primo piatto), proceeds in a leisurely fashion to a second course (secondo piatto), usually meat or fish without much accompaniment, followed by a plate of vegetables or salad (contorno), and is completed with a dessert (dolce). Then maybe a liqueur or coffee. It would take a large appetite and a lot of time to get through all the courses on offer, and there is absolutely no requirement to do so. It is perfectly normal to skip whatever you want - as a vegetarian I very rarely order a secondo piatto. A starter, primo piatto and dessert is usually a complete, filling meal. If having a mixture, they may arrive at different times - explain to the waiter if you wish, for example, to have your meat course while your companions have their first course. If the starters are costly or unappealing - often in Venice they are expensive fish dishes - check the list for the contorno vegetable course and consider asking for something from this list as your starter. Vegetarians in particular may find this a useful option in Venice. A pizza meal is a totally different affair, and Italians have their own rules for this. A starter, if desired, will be light, maybe a bruschetta, followed by the pizza and then - occasionally - a dessert. Beer or non-alcoholic drinks are the chosen beverage. If you want a 'proper' pizza, only eat in a a specialised pizza restaurant with an extensive pizza menu and a proper pizza oven. Don't be scared to eat alone. It's unusual to eat alone in Italy, particularly for women, but not unheard of. In Venice it's perhaps less uncommon since there are so many artists, eccentrics and loners here. I've never been made to feel unwelcome or uncomfortable in any of the restaurants I've reviewed, and any of our recommended restaurants are fine for the solo traveller. In our restaurant recommendations we've listed reasonably-priced restaurants and a cheap self-service option. Instead of two sit-down meals a day, try a slice of take-away pizza or having a roll made for you. Venetians 'graze' a lot, and in the local bars you'll usually find a choice of small sandwiches and rolls, and maybe some fresh salad. Sitting at an outdoors bar table with a light meal - cheese on toast or a salad - usually works out cheaper than a restaurant as you won't be charged for so many extras. We suggest other ways to save money on our budget travel page. In Venice you will find a lot of seafood and lagoon fish on offer. 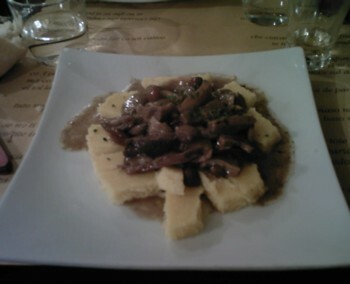 Polenta is a regional speciality, often served with fish or meat, but sometimes with mushrooms or cheese. Seasonal specialities include peas and radicchio from Treviso. Characteristic dishes and local ingredients you might see on a menu include sarde in saor (marinated sweet and sour sardines), castraure (baby artichokes), seppie in nero (cuttlefish in its ink), granseola (spider-crab), fegato alla veneziana (calf's liver with onions) and thin-sliced beef carpaccio. Desserts are not usually terribly good in Venice - typically the choice is something like dry local biscuits from Burano, panna cotta or tiramisù. I'm a vegetarian and I haven't had many problems dining in Venice. Some restaurants only list seafood on their menus; if you're with companions who fancy this, try asking the waiters if they can do a simple vegetarian dish. Spaghetti al pomodoro (with tomato) is a stand-by of most primo piatto menus, and can often be produced even if it's not listed. There are usually several other vegetarian pasta options, and occasionally there are secondi piatti based around cheese rather than meat. 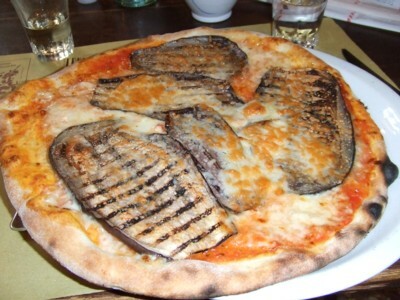 As elsewhere in Italy, it's always a good idea to query the contents of a dish: "E' vegetariano?" "Non c'è carne dentro?" (is it vegetarian? there's no meat inside?). Stuffed pasta like tortelloni traditionally - though not always - has meat contents and sometimes this is taken for granted. A pizzeria is always a good bet for vegetarians: lots of traditional pizzas are suitable including the classic cheese-and-tomato margherita. There is no vegetarian restaurant in Venice, but there are some good restaurants with vegetarian choices, which we list on our restaurants page. Especially if you are ordering a haphazard selection of courses, or combining pizza and pasta, be prepared for your dishes to arrive at odd times - even if you specify the order in which you want them served, you may still find some members of your party are finishing a course by the time the others' food has arrived. This is just a feature of dining in Italy: forget your manners and get tucked in while your food is still hot. Table manners in general are less important here than enjoying your food, so feel free to trail spaghetti over your chin or share your food around the table. Take a dictionary or a guidebook with some food vocabulary - even if menus are in English this can help to clear up any ambiguities.